Overwatch Season 10 begins on 4/30! It is bringing exciting changes, such as Brigitte in competitive, so it is important to be informed when going into placement matches. Here are the five current best heroes to play in order to do well in them. 5. Lucio As of Season 9, deathball comps are super popular and they are almost impossible to run without Lucio. His speed boosts are essential for this playstyle and his ultimate allows for teams to recover after a hard engage. Lucio is perhaps the best pure support in the game right now. 4. Tracer Tracer is back in the meta and for good reason as she is able to just jump in, kill, and get away. Brigitte was speculated to be a good counter to her, but she has fallen short and Tracer is roaming free. Tracer is by far the best offense hero going into this season. 3. Winston Winston is as broken as he is terrifying. Perhaps the only tank able to match D.Va at the moment, Winston not only is tough to kill between his base health and ult power, but deals ridiculous damage. For players who love to jump in 1v6 and kill the enemies before dying, here's your hero. 2. Moira This biotic support is known as the all gold hero for a reason - she almost always gets gold medals in every category. Between her high mobility, insane damage, and almost unbeatable healing, Moira is a must play for anyone who likes DPS and Support. 1. D.Va D.Va has been in the meta forever now, and for good reason - she does mobile tank the best. It's as simple as that, no other hero is as good as her in her role. While there have been proposed ideas to fix the D.Va monopoly, nothing major has happened yet and she is the best hero to play for consistent wins. All in all, skill is the most important factor. If you're not comfortable with these heroes, I'd stick to what you know. These heroes just have slight advantages currently, so I wanted to give people who may not play as much an idea of who is strong! Also support mains keep in mind, Brigitte will be a good counter to dive comps, so make sure you practice up! Good luck in Season 10! Greetings everyone! As some of you know I have been for a long while in the process of forming ADK's competitive team(s) for some time now. The task wasn't easy, but we're finally here! My initial goal was to get at least 6 members interested to form a single team, and here we sit, on the cusp of creating another team and hopefully getting enough to have 3 competitive teams playing for ADK. I want to thank all of our Overwatch staff and members for bringing in new players and making it a positive and fun place to play. Right now our initial stage is to form these teams and establish play times when we can practice together and learn each other's play styles. In the future we do plan to have scrims, coaching and tournaments between the teams to further our players' skills. Now without further waiting and ado, your ADK Overwatch comp teams: Team Phoenix Cuddles the Bear Fooie Hellraiser Markivo MrGrimm StarFirezz Team Hydra Dhmazed Feisty Gunnar Pinked PlasmaWisp TitanCMD Note: Given the volume in people interested in these comp teams, we have a third team, Team Cerberus, in the works. More details about that to be announced later. Its still not too late to join! If you're interested please contact me or any of the Overwatch staff and sign up here! If you're not a member and want to play I highly encourage you to get on discord and apply on the forums. Overwatch ADK UGC Teams Are Going to Playoffs! 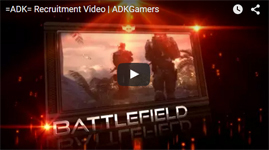 UGC Season 4 Playoffs Two months ago ADK decided to bring on two UGC Teams. One to compete in the Steel Division, and one to compete in the Silver Division. We went into this decision hoping to give the opportunity for more of our members to compete. As this is only our third time competing in UGC, and our first competing with two teams, we did not expect this result. I'm proud to announce that both UGC Team A and UGC Team B have made it into playoffs! Playoff Information For full information, please take a look at the article written by the UGC League: Click Here! The top 8 teams from the Silver Division will compete (UGC Team A) The top 16 Teams from the Steel Division will compete (UGC Team B) Playoffs start on July 13th and will go until August 7th. The format is double elimination. Playoff Bracket: Click here! The Future of UGC With the success of both of our teams, we hope to continue the two team format. Please stay tuned for future announcements regarding next season's roster, and possible signups for both teams. If you have any questions about either of the UGC teams, please feel free to contact an Overwatch staff member. Overwatch Contenders - Prelude to Overwatch League! Today, Blizzard announced Overwatch Contenders - "the development league for aspiring Overwatch League professionals, kicking off in summer 2017 in North America and Europe." This is super exciting for those of us who have been eagerly waiting for Overwatch League and nervously watching as Blizzard has been drying up licenses for grassroots tournaments like OMM. With big prize pools, open qualifiers, and culminating in a LAN tournament for each region, it's everything that's been missing while Blizzard has been working on getting OWL together! Finals for APEX Season 2 (current most premiere OW tourney in the world) were this morning. Here's the VOD. The last few months have been great for the Overwatch sections. With inhouses every Friday night, and just having finished our first official tournament, things are looking good. We've noticed that there are a lot of players with a thirst for competition. They're the ones that never hold back, and always want to do their best. As much as we love to get serious in our inhouses, we want our players to know that ADK stands behind them wanting to take their play to the next level. That's where the UGC tournaments come in. For the next two weeks, we will be gathering our best players to join and compete with ADK. We hope that in this environment all those involved will grow as players, and continue to represent ADK in the best way possible. Whether you want to be the one dealing all the damage and getting epic teamkills with Deadeye, or you plan to save the team with a perfectly timed resurrect, we want you. Come out and sign up. If you're an official ADK member, we want to see if you have what it takes. Once the team members are selected, it's go time. The players will participate in weekly matches, and if things go to plan will participate in playoffs later in the season. Don't worry if you don't get selected, or if you would rather remain a casual player. We hope to have some of our players stream the match (On a 90 second delay, per the rules), so that everyone can participate in the experience. Sign Ups & More Information! Heyo, CptDynick at your service!